This holder is made of tough plastic and comes with all the necessary hardware for mounting. *Will adapt to almost any off-road rear fender. Fits perfectly and creates a good solid base for my plate. Glad it came with hardware. I removed the inner rear fender on my KLR650 and used this plate to mount my license plate on the rear fender. Worked great and came with a ton of hardware that can be thrown in the spare parts bag. Buy this if you want to stop ruining your license plates. I have tried lots of plate holders but this is the only one that saves my plate after going down. I own two of these, one for each bike. I'm a fan. Enduro Engineering is a great company. Check out their other products. Great product for attaching license plate to fender or tail light. Gives the plate the right amount of reinforcement, perfect size. Acerbis makes great products, this is one of them. Very durable, I’ve had one on another bike for years, survived many crashes, still in tact. They include all mounting hardware also, which is helpful. I had to reinstall this thing and move it down after I noticed it was blocking the blinkers. It looks nice and is very well made though. No real complaints I guess. If you take your time and drill the holes properly, this plate holder fits perfectly and looks great. Nice mounting hardware and solid construction, good overall value for the price. Great fit. Comes with all hardwear for mounting. Multiple holes to fit different bikes. Durable and strong. Comes with a large assortment of mounting bolts and has numerous mounting positions. What can I say other than it is an Enduro Engineering product. Good price, still holding strong after a couple of get-offs. <br>Finally broke, flipped the bike an a steep rutted out hill, landed on the plate, which was pretty trashed, so it took a lot of abuse before giving out. It was still rated high in my mind. It lasted longer than I thought it would. Good if you have something to mount it to! The Enduro Engineering License Plate holder solves this problem. It worked great on my Street Legal 2005 KDX220. 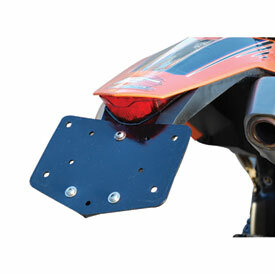 Easily mounts to OEM tail light kit with included hardware. Looks thick and durable, will have to put a few more hours on it to tell. Will this work on a 2008 WR450F ? From what I can tell, these are a universal fit. If you cant get it to fit with the existing holes, just drill a couple new ones in the plastic and your good to go. Fits my 2005 CRF 250x perfectly! Most likely. There are a few holes that can be used for various bikes. I fixed mine directly to the rear fender.